17 min. 12 sec., buckets, chromogenic print, 49, 53 cm x 33,02 cm. Featuring recent video works by a selection of Canadian and international artists, Performing Lives explores—and bridges—the supposed gap between documentary and entertainment, information and spectacle, fact and fiction. Making references to and borrowing methods from TV, film, theatre, dance, and music, these videos represent various groups using strategies that venture beyond the expository approach characteristically associated with documentary cinema. The expository approach indisputably plays a crucial role in informing the public, especially in the face of deceptive propaganda, the phenomenon of “fake news,” and the dissemination of other sorts of misinformation. In Performing Lives however, the featured videos eschew straightforward didacticism, instead embracing an array of performative strategies to draw in the viewer. They offer new awareness of and insight into the experiences, perspectives, and interests of groups whose collectively shared identities intersect with a multiplicity of factors—from ethnocultural origins and gender to leisure activities and life experiences: a Roma community living in the outskirts of Paris, Indigenous survivors of Canada’s residential school system, undocumented Guatemalan labourers in suburban Los Angeles, Twin Peaks fans, and young Asian-Canadian women. Blurring the traditional binary categories of fiction vs non-fiction and their commonly associated attributes (lies vs truth, frivolity vs seriousness, etc. 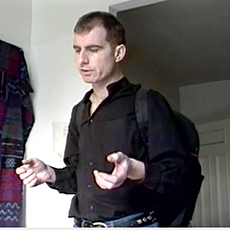 ), Cowie’s definition of documentary offers a useful entry point into the hybridised narratives articulated in the videos comprising Performing Lives. Francis Ford Coppola’s iconic film The Outsiders, based on the popular young adult novel of alienated masculinity by S.E. Hinton, is re-cast with an all-female crew of Asian descent (May Troung, The Outsiders). The ongoing trauma of residential schools is played out in a hip-hop dance sequence inspired by zombie movies and the creepy music video for Michael Jackson’s Thriller (Lisa Jackson, Savage). Though less brashly “mashup” in their respective approaches, the other videos in Performing Lives place equal emphasis on storytelling through embodied performativity: Twin Peaks enthusiasts act out the roles of their favourite characters from David Lynch’s cult series in scenes written entirely by fellow fans (Helen Reed, Twin Twin Peaks); the day-to-day struggles of the inhabitants of a Roma camp are evoked in a series of folktale-like vignettes (Bertille Bak, Transports à dos d’hommes); a Home Depot parking lot in Los Angeles becomes the unlikely setting for displaced Mayan migrants performing choreographed movements that allude to Guatemala’s bloody civil war in which they fought (Yoshua Okón, Pulpo). While these videos display a range of production values ranging from the DIY aesthetics of community theatre to the professional polish of mainstream cinema, they share a focus on so-called real people— often amateur or untrained performers—who are intimately and intrinsically linked to the stories expressed. Employing familiar performative conventions from a range of pop cultural platforms (musical numbers, dance sequences, role play, costume, and so on), these videos compel viewers to focus not only on the content of the stories but also on how their subjects actively embody their roles. Scholar Carrie Noland contends in Agency and Embodiment (2009) that “culture is both embodied and challenged through corporeal performance”; to study the body’s many gestures is to understand how “human beings are embodied within—and impress themselves on—their worlds.” In this way, the body is written on by socialising forces—but also has the agency to write its own story. 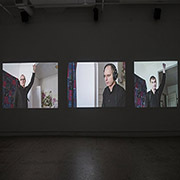 Noland argues that we should consider “how the body might speak to us—not beyond but through cultural frames.” Working in this vein, the videos in Performing Lives share a discernable interest in highlighting the agency of the body within rather than despite the codified structures of dancing, singing, or acting. Asking what new understandings we can glean from the performing subjects, the exhibition offers viewers a window into the perspectives, subjectivities, and experiences of the groups depicted. French artist Bertille Bak is known for her commitment to the collaborative process. She gathered footage for Transports à dos d’hommes after spending time living in a Roma camp on the outskirts of Paris. Bak and members of this Roma community have created a playful folktale that hints at the many challenges they face: ongoing demolition of their camps by French authorities, the possibility of expulsion from France, poverty, homelessness, and unemployment. A striking mashup of historical drama, melodrama, musicals, hip-hop, and horror movies, Savage examines the profound trauma—but also the resilience—of Indigenous children removed from their families and placed in residential schools. Featuring no dialogue and two stunning musical sequences, it tells the story of a young girl (interpreted by Ta’Kaiya Blaney, a performer and activist from the Tla’Amin First Nation), who is taken away from her mother (movingly played by Skeena Reece, an artist of Tsimshian/Gitksan and Métis/Cree descent). Pulpo features a group of Mayan men who fought in the Guatemalan Civil War of the 1990s. The video was shot in a Home Depot parking lot in Los Angeles where these men, now undocumented migrants, met daily to look for work. Reenactments of the American Civil War are typically played out by hobbyists who in fetishistic detail recreate historic battle scenes; in contrast, Pulpo evokes its subjects’ experiences through a performance of simple choreographed gestures, far from home, sans heroic spectacle. 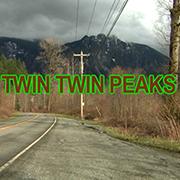 Entirely shot and interpreted by Twin Peaks enthusiasts on a minimal budget, Twin Twin Peaks is the realisation of a screenplay written by fans of the original series who were upset by its abrupt ending after its second season in 1991. Helen Reed highlights the creativity and esprit de corps of the writers, cast, and crew in this unpolished DIY passion project that melds aspects of TV, community theatre, and social practice. May Truong riffs on S.E. Hinton’s coming-of-age novel The Outsiders and Francis Ford Coppola’s film based on the book, as well as Robert Frost’s poem “Nothing Gold Can Stay” (featured in the book and film). Replacing the white male protagonists with an all-female, Asian-Canadian cast selected from her own circle of friends, Truong composes brief vignettes that draw from the alienation experienced by the young anti-heroes of Hinton’s book. Zoë Chan thanks the artists in Performing Lives, OPTICA, Vtape, Galerie Xippas, Antonio Loro for his editorial feedback, ICI (Independent Curators International), and the Canada Council for the Arts. SIROIS-ROULEAU, Dominique. « Vies performatives, Optica, Montréal », Esse arts + opinions, no 93, Spring-Summer 2018, [p. 106]. EL-SHEIKH, Tammer. "Performing Lives at OPTICA", Akimbo-Akimblog, March 7, 2018. MAVRIKAKIS, Nicolas. «Vies performatives» : jeux de rôles à Optica, Le Devoir, February 3, 2018. MOCKLER, Veronica Florence. Coverage of the exhibition "Vies Performatives" at OPTICA, contemporary art centre, Les Étangs d'Art, Radio CISM 89.3 FM, January 30, 2018. ALLARD, Benjamin J. Couverture de l'exposition "Vies Performatives" à OPTICA, un centre d'art contemporain, Le Retour, Radio CIBL 101.5 FM, January 2018. Canadian Art, "Must-Sees This Week: January 18 to 24, 2018", Canadian Art, January 18, 2018. BEHA, Claire-Marine. « 11 expositions à découvrir en ce début d'année à Montréal», Le Baron, January 15, 2018. 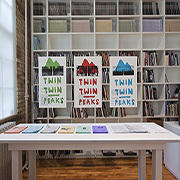 Helen Reed, Twin Twin Peaks, 2010. Vidéo, 18 min 34 sec. Video, 18 min. 34 sec. Production materials (posters, newsletters, photographs, call sheets, auditions video). With friends or family, enjoy the Family Saturday to discover the exhibition Performative Lives and contribute to a great collaborative story. During this workshop you will be invited to experiment with styrofoam engraving. For children aged 4 and older. 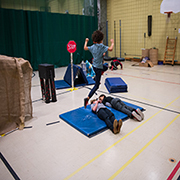 The educational program is supported by the ministère de la Culture et des Communications and the City of Montreal as part of the Entente sur le développement culturel de Montréal. Video,18 min. 34 sec. Courtesy of the artist. 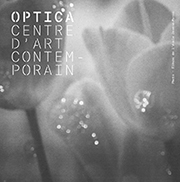 OPTICA will be part of the Nuit Blanche, on March 3rd the gallery will be open from 7pm to 1 am. Get into the multi-artists video exhibition Performing Lives, curated by Zoë Chan, in which artists scramble the codes of video. Dig into the universe of Twin Peaks and imagine a sequel to David Lynch’s famous work. The youngest visitors will be invites to create a flip book, putting into images an alternative end to their favorite fairytale. Coffee and donuts will be served! Autour de l'exposition Vies performatives : visite de Lisa Jackson! In conjunction with the exhibition Performative Lives, Lisa Jackson will be in Montreal to give a masterclass and present her work to film students at Concordia. The artist will be present at OPTICA Wednesday, March 14th, from 1pm to 3pm. This meeting offers a context favorable to the exchanges on the artistic practice of the artist. Welcome everyone! With a background in documentary, including acclaimed short SUCKERFISH, RESERVATION SOLDIERS for CTV, and the CBC-broadcast HOW A PEOPLE LIVE, Lisa Jackson expanded into fiction with SAVAGE, which won a 2010 Genie award for Best Short Film. Her cross-genre work includes current affairs, animation, performance art film, and a musical. Playback Magazine named her one of 10 to Watch in 2012, the ReelWorld Festival named her a Trailblazer, and her work has played at festivals internationally, including Berlinale, Hot Docs, SXSW, Margaret Mead, and London BFI, as well as airing on many networks in Canada. Lisa Jackson is Anishinaabe, has a BFA in Film Production from Simon Fraser University, and has completed the Canadian Film Centre’s Directors’ Lab. She is the Director Mentor for the National Screen Institute's Aboriginal Documentary Training Program. Celia Perrin Sidarous, Vibration (Kerameikos), 2016. Impression jet d'encre. 101,6 x 122,93 cm. Avec l'aimable permission de l'artiste et de Parisian Laundry, Montréal. | Inkjet Print, 101,6 x 122,93 cm. Courtesy of the artist and Parisian Laundry, Montreal. As part of the Artist at School program developed since 2014 by the OPTICA center, artist Celia Perrin Sidarous invites students in grades 3 of St-Arsène Elementary School (Petite-Patrie) and grade 1 of Jeanne-Mance High School (Plateau Mont-Royal) to think about the poetics of space. Following a tour of the Outre-vie/ Afterlife collective exhibition with the artist, they will undertake a series of film photography workshops using different cameras and a studio designed in the manner of Perrin Sidarous. In the end, the students will produce a collective publication that will be launched at OPTICA on June 13, 2018. OPTICA would like to thank the staff and students of St-Arsène Elementary School and Jeanne-Mance High School. à la Société des plantes, 2014. 76,2 x 114, 3 cm. Avec l'aimable permission de l'artiste. | Inkjet printing, 76,2 x 114, 3 cm. Courtesy of the artist. “Afterlife is when one is not yet in life, when one watches it, when one seeks to enter it. She is not dead but already almost living, almost born, perhaps being born, in this passage beyond borders and outside of time which defines desire. Desire for the other, desire for the world. That life may flow as into a swollen waterskin. And one is still far away. Afterlife is like overseas or beyond the grave. One must pass beyond the rigidity of the obvious, of prejudice, of fears, of habits, pass beyond the obtuse real and enter into a reality at once more painful and more pleasant, into the unknown, the secret, the contradictory, open one’s senses and know. Pass beyond the opacity of silence and invent our existences, our loves, where there is no longer destiny of any kind 1”. Marie Uguay, L’outre-vie, Éditions du Noroît, Montréal, 1979, p. 9. Outre-vie/ Afterlife was formed by Raymonde April in 2013. The group is made up of thirteen image practitioners whose work aims to develop a concept of afterlife that belongs to the language of images. Taking its name from a work by the late Québec poet Marie Uguay, the group is united by a shared dialogue about storytelling and the vicissitudes of memory. 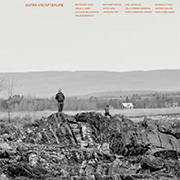 The group has exhibited large-scale photographs, video projections, experimental writing, and sound installations in Québec and abroad. 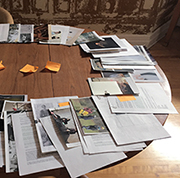 These collective engagements have generated new collaborative modes of production and dissemination, including a practice of archiving their collective art-making process. The exhibition introduces photographs, videos, texts and archival elements that reflect the collective’s daily activities, including individual works by some of its members. I imagined forming a group that could collectively map the existence of photographic images—their past and their future. I wanted to create a community that could consider the way images have their own space and their own lives, and how they respond to you when you look at them. Then India broke this all open. When I went to India for the first time in 2012, for a residency in Mumbai, this project was still living in me but was not yet born, in a sense. I needed to make images just to understand what was going on in Mumbai. When I came back to Montreal, Mumbai was like a surreal fantasy that inhabited me, because no one else around me had been there. I invited more people into the story that was emerging and they had their own affinities. Our practices as image makers began to reflect and expand the concept of afterlife so that it gained new values and meanings. Some members of the group explored geographies that resonated with spectral traces of disappearance. At the same time, others found, in the sculptural forms of objects, ways to observe or distinguish layers of history and memory embedded in the material world. Eventually, more and more members of the group went to India. It’s a biographical thing. It just happened this way. Our first collective activity was storytelling, which is an exercise in memory. It’s also a way to revisit our archives, which is something that has been important to my practice for a long time now. It was logical, then, that we would create a living archive that continues to multiply and proliferate. Through this collaborative process of montage and juxtaposition, overlooked fragments of memory were recorded and gathered in a shared space, giving rise to unexpected new trajectories. This mode of collective work has allowed us to examine the fluid boundaries of self and other, memory and forgetting, reality and fiction, and continuity and fragmentation in generative ways. It has also had the effect of dulling our individuality as artists while simultaneously preserving it. We share generously as our individual roles become more and more anonymous. The archive is a visual commons that has the power to open up new pasts and to explain or even call into being new futures. In this sense, Afterlife became about developing modes of community through art-making. From an interview between Gwynne Fulton and Raymonde April for the book Outre-vie/Afterlife, Québec, VU, 2018, p. 6. CAMPBELL, James D. «In Pursuit of the Afterlife [En quête de l’outre-vie]», published in Ciel variable, no. 110, «Migration», Montréal, 2018, pp.48-57. L’HEUREUX, Chantal. « Interview avec Raymonde April», Magazine radio In situ, June 13, 2018. DELGADO, Jérôme. «Raymonde April et la vie seconde des images», Le Devoir, April 14-15, 2018. Raymonde April lives and works in Montreal, where she teaches photography at Concordia University. Since the late seventies, she has been known for her minimalist approach of everyday life, between documentary, autobiography and fiction. Her work has been exhibited in Canada and abroad. In 2003, Raymonde April received the Prix Paul Emile Borduas, the highest distinction awarded by the Government of Quebec to a visual artist, and in 2005, her contribution to the development of Canadian photography was recognized by the Paul de Hueck and Norman Walford Career Achievement Award for Art Photography. In Raymonde April’s photographs, moments of everyday life are captured and magnified through the formal qualities of the photographic image. Her work happens where she finds herself with the subjects that surround her. Most of her photography was created in black and white, until 1999-2000, when she started to introduce colour and digital photography, writing, film and video, juxtaposing found images from her archives with new ones. Jacques Bellavance is a Montréal based visual artist who is intrigued by concepts of simulacrum, non-spaces and Virtual Reality. He also uses photography as a means to explore his hybrid cultural identity through an extensive investigation of the city of Shanghai. His photographs draw upon the intertwining of documentary-style and narrative driven self-exploration to unearth aspects of his Chinese heritage. He received an MFA in Studio Arts from Concordia university in 2017. Co-founder of Galerie Éphémère, he’s currently working on an unannounced VR project. Velibor Božović grew up in Sarajevo, Bosnia-Herzegovina. When he was in his twenties, the country of his youth became a war zone and Velibor spent the duration of the siege of Sarajevo honing his survival skills. In 1999, Božović moved to Montréal where he worked as an engineer in aerospace industry before he devoted his time fully to image creation. Subsequently, Božović earned MFA degree in Studio Arts at Concordia University. His projects have been supported by the Canada Council for the Arts and by Conseil des arts et des lettres du Quebec. In 2015 he was awarded the Claudine and Stephen Bronfman Fellowship in Contemporary Art. His work has been exhibited in Canada and internationally. Gwynne Fulton is an image theorist and practitioner based between Tio'tia:ke (Montréal), in Kanien'kehá:ka territory and Bogotá, Colombia. 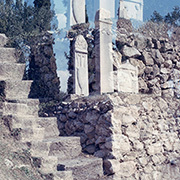 Her work interrogates the intersection of sovereignty and photography in contemporary necropolitics. She holds an MFA in Cinema and is a PhD candidate in Philosophy, Visual Cultures, and Curatorial Studies at Concordia University. She was a SSHRC Fellow at the Center for Research in Modern European Philosophy at Kingston University (London) and a Fulbright Fellow at Villanova University (Philadelphia). She has published essays on death penalty photography, contemporary painting and installation art and has programmed public screenings about the carceral state and the trajectories of illegalized migration in the Black Mediterranean at Slought Foundation (Philadelphia). Her films have been included in programs at Dazibao, the Leonard & Bina Ellen Art Gallery (Montreal), and the Ann Arbor Film Festival (Ann Arbor). Katie Jung finds no comfort in business-as-usual work efficiency. Instead, she seeks out tedious and time-consuming tasks in an effort to undermine the limitations of conventional practice (and what it can, should, and will produce). Katie is happiest when she is collaborating with materials. This takes different forms: making images, repairing ceramics she spun on the wheel, transcribing conversations, arranging flowers found in the church dumpster, building a tiny-house, or walking with her service dog, Spoons. Through these engagements of continuous making she seeks a present that is different from itself. Jinyoung Kim translates personal narratives into poetic visions through symbolic and metaphoric visual condensations. Her work resonates with everyday experiences, imbuing them with meaning by appropriating them into different contexts. She is interested in conditions of liminal self-identity and displacement. Kim holds a BFA from OCAD University in Toronto and received her MFA from Concordia University. Her work has been exhibited in Toronto and Montréal, including exhibitions at the Leonard and Bina Ellen Art Gallery, Galerie Lilian Rodriguez, and Espace Cercle Carré. In 2014 Kim was shortlisted for the Claudine and Stephen Bronfman Fellowship in Contemporary Art; in 2012 she received the Roloff Beny Foundation Fellowship in Photography. Kim lives and works in Montréal. Lise Latreille is an artist working with photography. Her work explores the poetics of space through looking at the surfaces, materials, and boundaries of public and private places. Latreille was born in 1984 in Shawville, Quebec, and is currently based in Montreal, where she is completing an MFA at Concordia University. Her work has recently been included in exhibitions at FOCUS Photography Festival (Mumbai), Galerie VU (Quebec City), and Galerie La Castiglione (Montreal). Celia Perrin Sidarous holds an MFA from Concordia University with a concentration in Photography. Her work has been shown in solo and group exhibitions at Arsenal Contemporary, New York; 8-11, Toronto; Parisian Laundry, Montréal; Esker Foundation, Calgary; Campbell House Museum, Toronto; Dunlop Art Gallery, Regina; The Banff Centre, Banff; WWTWO, Montréal; VU, Québec City; Gallery 44, Toronto; and was featured in the Biennale de Montréal 2016 – Le Grand Balcon. She is the recipient of the 2017 Prix Pierre-Ayot and of the 2011 Barbara Spohr Memorial Award. Her works are part of several private and public collections, including the collection of the Art Gallery of Ontario, and the Musée d’art contemporain de Montréal. She lives and works in Montréal. Marie-Christine Simard lives and works in Montreal. Her work has been presented in several group shows in Quebec (Dazibao, Vu, Vox, Séquence) and Canada (AceArt, Richmond Art Gallery, AKA). She holds an MFA from Concordia University where she has been teaching since 1995. Her work stems from observations of nature and the everyday. In her recent video work titled Gagnon, a man revisits the landscape of his childhood where nature has reclaimed an abandoned mining town in Northern Quebec. It is in the spirit of a photographic series, Héros, presented at Les Territoires in 2010, that explores representations of unexpected heroic figures. Bogdan Stoica is a Canadian artist, Filmmaker and Director of photography. He holds a bachelor's degree in cinema and photography, and a master's degree in studio arts. Using photography, sculpture and cinema, his artistic work focuses on the boundaries between documentation and fictionalization and is particularly interested in questions of ethics, sharing and the encounter with the other and oneself. His works are exhibited in Canada and abroad, and are highlighted and promoted through institutional and government scholarships. His first feature documentary, Omni: An Act Against Gravity (2018), will have its World Premiere at the renowned HotDocs Film Festival. Andrea Szilasi lives and works in Montreal. She holds an MFA in Studio Arts (Photography) from Concordia University (2016), a BFA in Studio Arts (Painting and Drawing) from Concordia University (1991), and a BA in Film Studies and French Language and Literature from the University of Toronto (1988). Andrea Szilasi is a photo-based artist whose work examines the representation of the human body in the photographic medium. Since 1994, her work has been presented in many solo and group exhibitions across Canada, the United States, Mexico, Europe and India. Andrea Szilasi’s work is included in several public and private collections including those of the Montreal Museum of Fine Arts, the National Gallery of Canada, the Musée national des beaux-arts du Québec, the Laurentian Bank of Canada, Cirque du Soleil, and Loto-Québec. Chih-Chien Wang was born in Taiwan and has resided in Montreal since 2002, where he obtained a MFA degree at Concordia University. His recent solo exhibitions could be seen at gallery PFOAC in Montreal (2017), Künstlerhaus Bethanien in Berlin (2016), Art Gallery of Mississauga (2015), Darling Foundry in Montreal (2015), Expression in Saint-Hyacinthe (2014), Musée régional de Rimouski (2013) and Montreal Museum of Fine Arts (2012), and group exhibitions at Jack Shainman Gallery in New York, Quebec Triennial at Musée d’art contemporain de Montréal, National Gallery of Canada, Zenith Gallery in Beijing, Aperture in New York, Musée de l’Elysée in Lausanne Switzerland. The Canada Council for the Arts awarded Chih-Chien Wang 2017 Duke and Duchess of York Prize in photography. Jinyoung Kim, Watching Birds, 2015. | From the series Seuls, ensemble, reproduced on cover. Tanha Gomes, Préparation d'atelier, 2018. Objets divers. | Workshop preparation, 2018. Various objects. Through the use of photography, video, experimental writing, and sound installations, Outre-vie/ Afterlife explores themes such as memory, reality, fiction, and the space between the self and the other. This collective composed of 13 artists, often gathers to informally discuss their individual and upcoming projects. In the spirit of the collective, a table will be set up with crayons, pens, paper, and material for collage and photo transfers. Come join us to create a travel journal where you can inscribe your impressions of the exhibition and more! 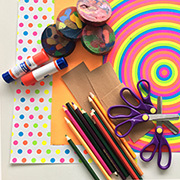 Creative family workshops will be held on the Saturdays April 21st and June 16st from 1 PM to 4 PM. the workshop is open to the whole family and will run continually. Feel free to join in at any time. Suited for children aged 4 and older. Raymonde April, Outre-vie/ Afterlife, 2017, maquette du livre. In conjunction with the exhibition Outre-vie/Afterlife OPTICA hosts a rond-table from 1 pm to 3 pm in the presence of the artists: a nice way to discuss about the thematic. This spring, the Artist at School program is in its 8th edition. On a proposal by Celia Perrin Sidarous, students in grades 3 of St-Arsène Elementary School (Petite-Patrie) and grade 1 of Jeanne-Mance High School (Plateau Mont-Royal) have been invited to think about the poetics of space. Following a tour of the Outre-vie/ Afterlife exhibition with the artist, they undertook a series of film photography workshops using different cameras and a studio designed in the manner of Perrin Sidarous. In the end, the students produced a collective publication that will be launched at OPTICA on June 13, 2018. OPTICA would like to thank the staff and students of Saint-Arsène and Jeanne-Mance. Maryse Larivière, Under the Cave of Winds, 2017. In her poetry and in essays of an often fictionalized autobiographical nature, Maryse Larivière puts her own voice on the line by going beyond oppositions between affective lived experience and the symbolic construction of sexual difference. Under the guise of research in art history, Larivière also produces analyses of artistic practices of the 1970s-among them Joyce Wieland-that were contemporary with the emergence of women's writing in the literary field. The epistolary novel Orgazing, one component of her installation at OPTICA, Under the Cave of Winds, continues with her own practice of assembling referential fragments in a mix of stylistic modes (poetry, theory, autobiography). The action is set on Staffa Island, Scotland. From her cell at the top of Fingal’s Cave, the narrator writes letters to her lover, weaving an amorous discourse that places the auditory pleasures of language before recognition of one’s desire by the “other.” As readers, we adopt the role of the hypothetical—and apparently male—subject addressed by the author, while remaining a third party, outside the transference relationship. Yet the exhibition encourages transgressive gestures in the literary space by way of an intentionally inadequate “adaptation” of the book. Thus, a 16-mm film strings together narrative fragments drawn from a breakdown of this “source text.” The artist plays the figure of the captive author, though she avoids showing her face, while the craggy landscape and architecture of confinement make surreptitious appearances. Saturating the cinematic apparatus, the scene of the writing, and the space in which we are strolling, the sculptures act as hinges or pivots. Some have a dissimulative function, like the rock that hides the film projector and thus emits a single beam of light, while the back of the screen becomes a load-bearing structure for an absent parrot. Yet these apparently motionless markers also change shape during our visit. In the parallax, their configuration alludes at once to the translation process Larivière undertook in composing Orgazing (English not being her mother tongue) and to the fluid movements of the character’s psyche as she invents her own language, made up as much of words uttered as of air exhaled. Vincent Bonin is a writer and curator. He lives in Montreal. He has recently published D’un discours qui ne serait pas du semblant/Actors, Networks, Theories, Dazibao, Leonard & Bina Ellen Art Gallery, Montreal. Maryse Larivière, Orgazing, Calgary, Untitled Art Society, 2017, 64p. Maryse Larivière is a researcher, author, and artist. She lives in Montreal. She has exhibited at Walter Philips Gallery, The Banff Centre, AB, Oakville Galleries, and galerie Division, in Montreal. The experiences we render into story are integral parts of who we become. Yet some stories remembered are more significant than others. These stories are often comprised of “vital memories” (Brown and Leavy) that recall a moment of drama or trauma in a life. Vital stories are not always coherent, or consistent. We may tell them slightly differently, only recall fragments, or embellish. Although we may share them with others, we may also repress or forget details over time. 47 Storeys is one such vital story. In 1996 Paul Litherland went to a bar at the top of a very tall building, drank a beer, waited until the other patrons and staff left, then parachuted into the night-time sky, landing safely on the street to the astonishment of two late-night revelers. Three months after the jump, afraid of forgetting significant details, Paul commemorated his adventure to video. 20 years later Paul revisits the event with Monique Moumblow. They re-edit the original 43 minute tape down to 11 minutes. Paul then attempts to re-enact his original mediated performance. On one screen we see Paul who sits, listens to himself through headphones, and speaks over his original narrative. On a second screen Paul attempts to duplicate his original performance word-for-word and gesture-by-gesture. On the third screen is the edited original. These three different renditions of the tale, from 3 different moments in time, are almost the same, but they never perfectly align. No matter how much we practice, the story is never exactly as it was. 47 Storeys is a brilliant and slightly comedic rendition of the “performative act of memory-making”(Kuhn). Narrating the past re-activates and catapults memories into the present, often with the help of souvenirs such as the video-tape and parachute equipment that Paul still keeps in his care. Paul’s fumbling narrative recollections lay bare this performative process of memory-making as past and present collide in a single temporal moment superbly visualized in this 3 channel video. In the re-telling of this vital story grey-haired, bespectacled Paul moves in imperfect harmony with his former self. This temporal collision invites reflection upon both memory re-enactments, story-telling and the vagaries of ageing: “the permanently fluctuating relationships between younger and older selves” (Segal). We see, hear and feel these fluctuations, experiencing a vertigo of narrative mediation: Paul’s post-hoc memory is rendered into story and captured on video tape, which is then digitally remastered in the present for the future. It is the absence of documentation of the original event –no pictures, photos or go-pro video–that makes the re-telling of the story so necessary and so compelling. Thankfully, Paul lived to tell the tale, again and again. Kim Sawchuk est professeure et directrice de Ageing-Communication-Technologies (www.actproject.ca), Université Concordia. Monique Moumblow is a video artist and a fan of spectacular storeys. Paul Litherland is a gentleman adventurer, a closet scuba diver in a room full of wingsuiters. Friday, September 7 - 7PM and Saturday, October 13, at 3PM. Orgazing is an epistolary novella set on the remote Scottish island of Staffa. A woman, held captive in an institution built atop Fingal’s Cave, addresses her beloved about their failed revolution, her attempt to transform writing into telepathic singing, and her effort to develop this mode of communication while incarcerated. Shifting between prose and poetry, word and birdsong, Orgazing explores the limits of body and voice, articulating an unsettled longing for metamorphosis. 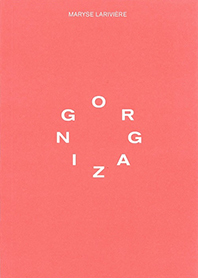 The themes explored in the artist’s book Orgazing include the sinuous paths of feminine desire, the wandering fluxes of nature and culture, and the concerted and agential relationship between mind and body in the making and thinking of art. Paul Litherland, Monique Moumblow, 47 Storeys, 2018. Installation vidéo à 3 canaux, son, circa 10 min. Paul Litherland, Monique Moumblow, 47 Storeys, 2018. Three-channel video installation, sound, circa 10 min. Crédit | Credit: Paul Litherland. Next Saturday October 20th, performance of Paul Litherland from 4PM to 5PM_the artist completes the cycle! As part of his exhibition at OPTICA in collaboration with Monique Moumblow, Paul Litherland presents a performance that sheds light around the jump. Closing Performance - the complete story of the jump!! Paul Litherland:"22 years ago, I jumped from a building without a camera, but with a parachute. A few months later, wanting to have some kind of document, I made a video recording of the story. 20 years later, I repeat the process. In collaboration with Monique Moumblow, we present the premiere of the work 47 Storeys, a video installation about memory, age, and technology". Public live feed of Paul Litherland performance. Obstacle course is a multi-session workshop that revolves around the idea of obstacles: What are obstacles? What are creative ways for overcoming them? How might negotiating a complex and risky path around an obstacle lead to a more interesting outcome? Framed by examples of contemporary art works that deal with these ideas, students work collaboratively to plan and construct their own sculptural version of an obstacle. In the final workshop of the series, the students combine their sculptures to create an obstacle “course” or path for their fellow students to engage with. In this way the workshop engages ideas of collaboration and communication, 2D to 3D construction, spatial awareness and installation art practice. SANDALS, Leah. "On Laundry, Playgrounds, Kids and Other Lost Art Legacies", Canadianart Magazine, interview with Leisure, Decembre 4, 2018.
Leisure is a Montreal-based collaborative art practice between Meredith Carruthers (1975) and Susannah Wesley (1976) founded in 2004. They have produced exhibitions and special projects in Canada and abroad, and participated in residencies in St. John’s (The Rooms, Newfoundland, 2016); Dawson City (KIAC, Yukon, 2010); Vienna (Kunstverein das weisse haus, Austria, 2008) and Banff (Banff Centre for the Arts, AB, 2007). Their recent projects include: How One Becomes What One Is (Musée d’art de Joliette, 2018), Conversation with Magic Forms (Vu Photo, 2017), Panning for Gold/Walking You Through It (Musée d’art contemporain de Montréal, 2017), Conversations With Magic Stones as part of The Let Down Reflex (EFA, New York, 2016) and Dualité/Dualité (Artexte, Montreal, 2015). Geneviève Chevalier, Bord d'attaque / Bord de fuite - Leading Edge / Trailing Edge, 2018. Image tirée du carnet. Impression jet d'encre sur papier coton, 43,18 X 60,96 cm. Since the publication of J.J. Audubon’s Birds of America in 1838, bird populations have constantly decreased, for some to the point of extinction. They are now but paper memories and preserved bodies in natural history museums. Artist Geneviève Chevalier tracked one species that has acclimatized and adjusted remarkably well to climate change. 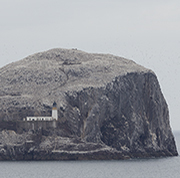 The “fou de Bassan,” or Northern Gannet, chose to make its home on craggy cliffs of Bonaventure island, where its colony of 100,000 individuals faces some reproductive issues, and on Bass Rock, off the coast of Scotland, which has a more prosperous population. 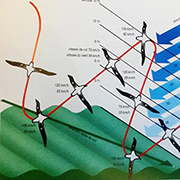 The Gannet succeeds where many other species have great difficulty enduring the impact of climate variations on food and water and air temperatures. Chevalier observed these specimens in their habitat and met with scholars in Quebec and Scotland. What she learned is reconstituted in a video diptych and artist book, the titles of which conjure a world of aeronautics. This Anthropocene era, in which man has become the most powerful of disruptive geological forces, has ushered in the Sixth Extinction event. The previous one, in the Cretaceous period, had, among other things, eradicated the dinosaurs. But the most devastating, dubbed the Great Dying, took place at the end of the Permian period; it resembled the current one in that it, too, was due to climate changes. Humanity had no part to play in that extinction, which stretched over a long period. But today the problem is exponential. The artist observes its collateral damage on the seabirds. The impact of current civilizations on wild flora and fauna also requires adjustments in how extinct species are collected. Now even animals impacted by oil spills are worthy of conservation, according to Bob McGowan, curator of bird collections at Edinburgh, as he confides with the artist in a section of her book, an essential counterpoint to the film. What was the cause of death for these bodies meticulously labelled and preserved in environmentally controlled chambers? Chevalier’s film prompts as many questions as it provides answers. The remains still have something to say, despite their silence. The film, too, is overcome with silence, the loop coming full circle, though not quite the same. Experts’ voices start to fade, subtly reflecting the difficulty in being heard, an auditory attrition of ecosystems, an extinction that devastates animal populations. More than ever then, Bass Rock, which dominates the view in Leading Edge/ Trailing Edge, takes the appearance of a fortification, a bastion of resistence, an outcrop of stability in this environmental debacle. Bénédicte Ramade is an art historian specialized in ecological questions. She is currently conducting research on the anthropocenization of knowledge and art practices. She is an independent curator and art critic and a lecturer at Université de Montréal. Public conversation at OPTICA, Saturday, December 1st, 3 pm to 4:30 pm between Geneviève Chevalier, Bénédicte Ramade (Université de Montréal) and Kyle Elliott (McGill University). MAVRIKAKIS, Nicolas. «Sur le radar : la nature des chose au Centre Optica», Le Devoir, December 14, 2018. MAVRIKAKIS, Nicolas. «Les arts visuels sous le signe de l’engagement», Le Devoir, August, 25 and 26, 2018. Geneviève Chevalier was a CALQ artist-in-residence at the Centre for Contemporary Arts, Glasgow, in 2017, the context in which the work was produced. Her work has been exhibited at the Musée régional de Rimouski, the Symposium de Baie-Saint-Paul, the Musée de Lachine, La Chambre Blanche at Manif d’art 7, and the Thames Art Gallery, Ontario. She lives and works in Eastman, Quebec. Virginie Laganière, Ex colonie marine Rosa Maltoni Mussolini, Calambrone (Italie), 2018. In her sustained residency work, Virginie Laganière adopts an attitude akin to that of an anthropological artist, mindful of immersing herself in the material and emotional texture of the spaces she studies. She conducts field work in which architectural structures in need of redefinition reveal an abundance of current and future potentialities. Developed during a stay at Studio du Québec à Rome, Le Prisme furthers this endeavour by dwelling on the formal and ideological universe of the colonie marine, or Italian seaside colonies. In the first period of their existence, beginning in the mid nineteenth century, these colonies were health-care facilities meant for children with TB. Ideally located on the coast, their tended cure was based on the purported benefits of sunlight and saline air. Under Mussolini’s reign, their purpose shifts toward indoctrination as they take on the aspect of somewhat militaristic summer camps. 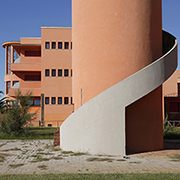 Often borrowing from the stylistic vocabulary of the ocean liner and deeply influenced by modernist architectural principles, the imposing buildings convey Party values and constitute veritable spatial instruments for influencing children’s behaviour. After World War II, the seaside colonies eventually establish a pedagogical vocation aiming to promote individual and collective emancipation through non-hierarchical learning activities. Some, in fact, have since been transformed into schools. Most, however, are in a state of neglect, still overlooking the sea, their great carcases strangely punctuating the landscape around seaside towns. Juxtaposing documentary and fictional fragments, Laganière proposes a free interpretation of the legacies of these heterotopias. Arranged with photographs, videos, low reliefs, small constructions, and even a light, aromatic mist, the exhibition space creates a total environment inspired by what the seaside colonies had once been. The outcome is less a commentary on their controversial past than a subtle look at current issues, in particular with respect to the practices of mass tourism: the accelerated privatization of the coastline and the impact of massive summertime migrations on local communities. Josianne Poirier is a doctoral student in art history. Her research concerns the fantastical nature of city lights. The DHC/ART Foundation recommends the exhibition of Virginie Laganière: The Prism as part of the DHC/ART Foundation newsletter of December 10, 2018 untitled "This winter at DHC/ART". L’HEUREUX, Chantal. «Vernissages/événements arts visuels autres du 3 au 9 décembre 2018», Magazine radio In situ, Radio Centre-Ville, CINQ FM - Radio Centre Ville 102.3 FM, December 5, 2018. MAVRIKAKIS, Nicolas. «Les arts visuels sous le signe de l’engagement», Le Devoir, August 25 and 26, 2018. With an MFA from UQAM, Virgine Laganière lives and works in Montreal. Her works have been exhibited in Canada, Mexico, Spain, Finland, Japan, and Switzerland. In winter 2019, partnering with Jean-Maxime Dufresne, she will take part in a group exhibition presented at Gallery de l’UQAM. The Italian colonie marine—or seaside colonies, children’s summer camps set up along the Italian coasts—whose origins go back to the middle of the 19th century, were once established as institutions dedicated to children’s physical and “spiritual” health. These heterotopias functioned on the fringes of society, yet were configured as full-fledged instruments of control. Geographically positioned on the periphery of inhabited areas—before urban sprawl and the development of coastal tourism—they had their own regulations and value systems. The maritime cures took place during a summer vacation, in which the children, removed from the familial cocoon, would live in a geographic, social, and architectural environment framed by the horizon and set to a different temporality. From a historical point of view, the seaside colonies fall into three main periods: the seaside hospices, the Fascist colonies, and the pedagogical colonies. 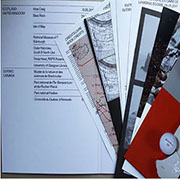 The publication, produced in collaboration with the TagTeam studio, is composed of three booklets each corresponding to a period of the Italian marine colonies (60 pages). It includes text and images of the artist. Congratulations to Virginie Laganière and TagTeam Studio! A 2019 Grafika Prize for the publication produced in conjunction with The Prism exhibition at OPTICA on November-December 2018. Bord d’attaque/ Bord de fuite, 2018. While filming and sound recording in Scotland (Ailsa Craig, Bass Rock, Isle of May, Outer Hebrides, Troup Head) during a residency at the Centre for Contemporary Arts in Glasgow, and in Eastern Quebec (Parc national de l’Île-Bonaventure-et-du-Rocher-Percé, Parc national Forillon), I became interested in the North Sea and North Atlantic Seabirds. 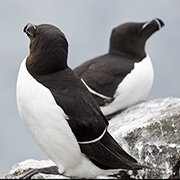 The video Leading Edge / Trailing Edge loosely evokes, through seascapes, portraits of birds and recent scientific data, the actual situation of boreal seabird species, in the era of climate change. A book produced in collaboration with Principal Studio, presents a series of booklets showing photographs of birds and landscapes, as well as specimens and images from scientific collections and scientific publications. Congratulations to Geneviève Chevalier and graphic designer Principal! 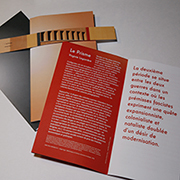 A 2019 Grafika Prize for the publication produced in conjunction with Bord d'attaque / Bord de fuite exhibition presented at OPTICA on November-December 2018. Esther B., Sans titre, 2018. Photographie numérique, taille variable. | Digital Photography, variable size. Geneviève Chevalier’s Trailing Edge/ Leading Edge looks at how climate change threatens the survival of seabirds. In this collage workshop, we will look at different birds form North America and explore the theme of migration. Where do they go, where do they come from? We will create a collaborative artwork tracing different trajectories, from those of birds to our own. The workshop is open to the whole family and will run continually. Feel free to join in at any time. Duration: up to 1 hour and 15 min. Public conversation at OPTICA, Saturday December 1st, 3 pm to 4:30 pm on climate changes and relation between art and science with Geneviève Chevalier, *Bénédicte Ramade, art historian, Université de Montréal, and **Kyle Elliott, Assistant Professor; Canada Research Chair (Tier II) Chair in Arctic Ecology, McGill University. *Bénédicte Ramade is an art historian specialized in ecological questions. She is currently conducting research on the anthropocenization of knowledge and art practices. She is an independent curator and art critic and a lecturer at Université de Montréal. **Kyle Elliott received his PhD in 2014 from the University of Manitoba, where he was a Vanier Scholar and Garfield-Weston Fellow. He received his two BSc’s in Physics & Math and Conservation Biology from UBC, followed by a MSc at the University of Manitoba. He completed NSERC postdoctoral research at the University of Western Ontario and the University of Guelph prior to starting at McGill in 2015. Kyle recently received the Ned Johnston Young Investigator Award from the American Ornithologists Union. He serves on the board of the Society of Canadian Ornithologists and on the Editorial Board of the Marine Ecology Progress Series. He has conducted research on four continents from the Amazon to the Arctic, but specializes in the Canadian Arctic where he has studied birds on 14 of the islands in the Canadian Archipelago over the past 15 years. The sustainability of Arctic communities depends on their access to clean and abundant food, which is the subject of Dr. Elliott’s research at McGill.